Can I just take a moment to say that that cover for this issue is like one of the most insanely awesome covers I’ve seen? I mean, if this is the kind of art quality that we can expect from this book, then by damn, I’m in it hook, line and sinker because I jsut can’t get enough of this. The cover gives you a perfect idea for Phil’s style in this series and in that manner, it is perfectly representative. How great is that? But honestly, I’m in love with that cover. Natasha’s pose is perfect, and I love its understated action. So, moving on to the story. The previous issue gave us a good look at this new Natasha. Nathan began by telling a great self-contained story in that debut issue and he does the same thing here as well. Most comics today, like ninety-five percent of them, have these long and involved arcs right off the bat and it can get disconcerting. Sometimes I just want to read a few comics where each story is in its own place and doesn’t really relate to anything else within the series, not directly. In this issue, we see Natasha takes on a more personal mission this time, doing something for someone who appears to be an old friend. The issue starts off right in the middle of things, right in the action, but Nathan does go back to fill in the blanks and show how she got to that point. What I liked was that this time Natasha goes up against someone who is almost a match for her, someone who does have a shot at taking her down. It helps establish that she is not as big a hotshot as you might think. It helps to ground her character in realism. It shows that even she has limits of her own. Moving forward, if Nathan maintains that same tone, then I’m sure that this will be a great series indeed. Another great thing about this issue was that Natasha’s agent got his own moment here to be a damn badass. It wasn’t something I expected at all and the surprise proved to be a great one indeed. Looking at him, you’d never think of him in those terms, seriously. How Nathan pulled that magic trick out of his hat, I have no idea, but pull it out he did and it is one of the many highlights of this issue. Speaking of the art, I can just look at this issue all day, it is that good. Having gone through two issues with this particular style, I can almost forget all my other favourite comics. The loose pencils give the entire an undefined style to a degree but it is an approach that works wonders. The entire red-pink palette also does its wonders. I mean, I’m not really sure what else to say about the art here. I love it. I’m really hoping that Phil Noto is on this series for like a hundred issues or something. 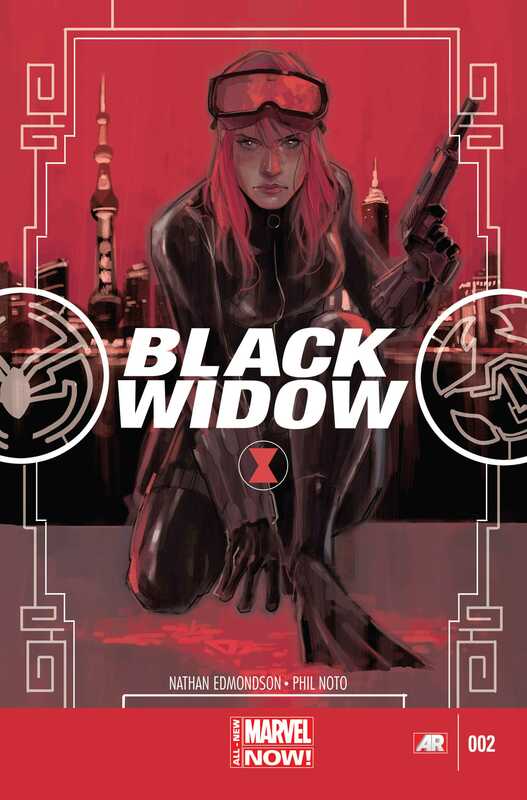 For me, just based on the art alone, Black Widow could well be the big break-out series of the year. Needless to say, this was pretty much a perfect issue. Posted on January 23, 2014, in Comics Reviews, Review Central and tagged All-New Marvel NOW!, Assassin, Avengers, Black Widow, Comics, Comics Review, Espionage, Female Characters, Marvel Comics, Marvel Now, Natasha Romanoff, Nathan Edmondson, Phil Noto, Review, Review Central, SHIELD, Superspy, VC's Clayton Cowles. Bookmark the permalink. 9 Comments.